Quite simply, I’m thinking about the kit that I’m expecting Infiltrators to get in due course and the options that might be available to them in that kit. For that, we first need to look back a bit about 18 months to the release of Dark Imperium upon the world, and the inclusion in that set of Intercessor Marines. The models in that boxed set were equipped with Bolt Rifles, whilst their commanders got different weapons. What we saw was that the lieutenant from the DI boxed set got an Auto Bolt Rifle instead, and many of us thought ‘why is that different, what the point of having one guy with a different gun’? All became clear of course once the separate Intercessor kit was released and in addition to the bolt rifle, we saw Intercessors get Auto Bolt Rifles as well as Stalker Bolt Rifles as options. All well and good so far, but let’s take that philosophy and apply it to the latest Vanguard release. We saw in that box that the Infiltrators get marksman bolt carbines, that auto-wound on 6’s to hit (unmodified, damnit!). The Captain however, gets an Instigator Bolt Carbine, and the Lieutenant gets an Occulus Bolt Carbine. Respectively, these allow the Captain to target characters even if they’re not the nearest, and the Lieutenant to ignore cover saves. 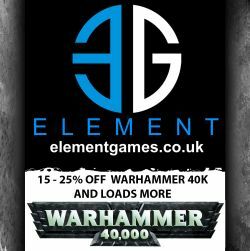 Whilst GW have said quite clearly (in Jes Goodwin’s second VoxCast interview) that they didn’t necessarily intend to simply replicate every type of model in every type of armour (hence why the Infiltrators incorporate a helix adept instead of a separate Apothecary) and therefore I don’t think we can blindly assume that every unit type will get a similar variety of options, that’s exactly what I’m going to do and postulate that we could very well see Infiltrator Squads with three different types of bolt carbine - one that auto-wounds on 6’s, one that ignores character targeting rules, and one that ignores cover. I feel slightly supported in that idea because each of the aforementioned bolt carbine weapons has a slightly different design on the models wielding them - not different enough to be a major thing, but easily incorporated by small additional parts squeezed onto a well-designed sprue! Let me know if you think my logic is way off here, and I’m not saying it’ll definitely happen but I’m getting more convinced by myself as time goes by. So what else could we possibly infer from that therefore? 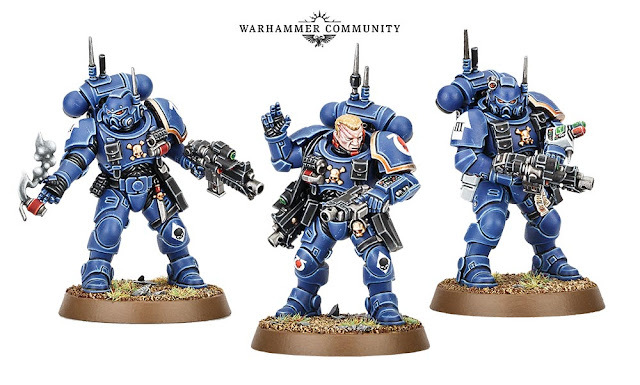 Well, the jump infantry unit from Dark Imperium (Inceptors) got a second weapon option, and I’m damn well sticking to my idea that Suppressors will get las-talons (which would make sense as to why such a long-ranged unit is currently equipped with jump packs since las-talons are only 24” range). The other unit from Dark Imperium was the Hellblasters, a fire support unit, and they got 3 variations of their armament. Whilst I would love to see Eliminators get a variety of alternatives, including perhaps an anti-tank rifle of some kind or perhaps an RPG launcher I think they’ll stick to what they’ve currently got. We then saw some additional kits get released in the Reivers and Aggressors, one close support and one fire support, and the Repulsor and Redemptor, plus a couple of support characters. Is it unreasonable therefore to expect to see a similar scale of release for marines this time around? Perhaps another Gravis armoured unit and a Tacticus squad of some kind, again with one fire support and one close support? We’ve been begging for a Primaris Techmarine since the original release and I’d love to see a Chaplain, either in Gravis armour or with some kind of jump pack/grav chute. Finally for vehicles again I think we’re overdue a transport of some kind, and if GW didn’t want to go down the route of just releasing a dreadnought variant (though a combat variant capable of blitzing through hordes with some kind of sweep attack and maybe carrying a sword would be welcome) then a flyer or Main Battle Tank would also be a very cool release. I’m not asking for too much am I? 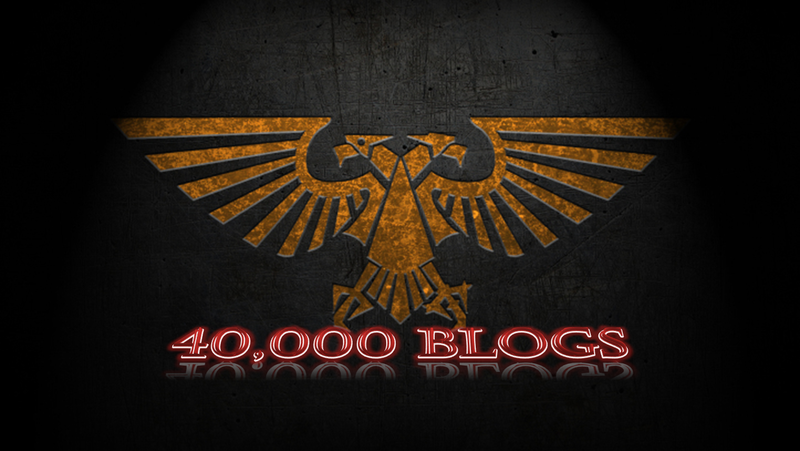 I’m fully expecting to see Marine Codex 2.0 this year, but probably not until GW are in a position to make the Primaris a fully functioning stand-alone faction. I get why some people don’t like the idea of splitting the Primaris off from the legacy marines, but heck, the marine book is already pretty unwieldy and even incorporating the Vanguard and their inevitable expansion units into the current tome would be too much I think. As a marine player, I’d much rather see two books, one for Primaris and one for Legacy marines that could both be taken in the same army and with the same Chapter Tactics etc. My thoughts are pretty much the same on the Bolt Carbines. I hadn't really thought about Suppressors, but Las-Talons could make sense there. For the Eliminators, I think maybe their multiple types of ammo might take the place of changing out their actual weapons. An Anti-Materiel Rifle would be pretty cool for them, tho. If you look at the Redemptor sprues, all the parts for the weapons are on one of them, while the other two have the body and legs. I've been assuming since it first came out that at some point it would get some other load outs with a different third sprue. A Techmarine, some Jump Pack character variants, and a "pure" Transport option would all be very welcome, but I don't know if we're going to get that much this wave. Agreed, I'm not sure Eliminators will get any alternatives, but I can hope, if only because carrying an even bigger gun would look awesome! You know what? I've never actually looked at the distribution of parts on the sprues with that in mind, how did I miss that??? Agreed, I think this wave will be smallish, but with another wave to follow fairly soon after - I think we'll see the new codex and another model release mid-late autumn/early winter.